Taiwan-based E Ink expected that China would contribute 30 percent of E Ink's global revenue by 2020, compared with 20 percent now. Frank Ko, chairman and CEO of E Ink, talks about the company's IoT strategy in Shanghai. E Ink Holdings Inc plans to increase Chinese revenue contribution to 30 percent by 2020, through business expansion into the Internet of Things (IoT) market, the world’s largest electronic ink technology vendor said on Friday. E Ink, or electronic ink, is a display technology with high visibility and contrast and low power consumption when compared with other displays like LCD. The most popular application is in e-book readers including Amazon’s Kindle, which can work for more than a month after each charge. “Intelligence and environmental protection have become long-term demands for China during its economy transformation and development," Frank Ko, chairman and CEO of E Ink said during the Mobile World Congress Shanghai. Frank Ko, chairman and CEO of E Ink, said during the Mobile World Congress Shanghai (MWCS). "This offers unique opportunities for E Ink." Taiwan-based E Ink expected that China would contribute 30 percent of E Ink’s global revenue by 2020, compared with 20 percent now. That growth would come from applications in education, retail and transportation sectors, Ko said. In their booth of MWCS, E Ink showcases IoT applications including display boards for retail outlets, tags in hospitals, screens at bus stops and smart devices for classrooms which are designed to protect students’ eyesight. Technology upgrades on IoT and AI (artificial intelligence) boost many new applications and create opportunities, researchers said. 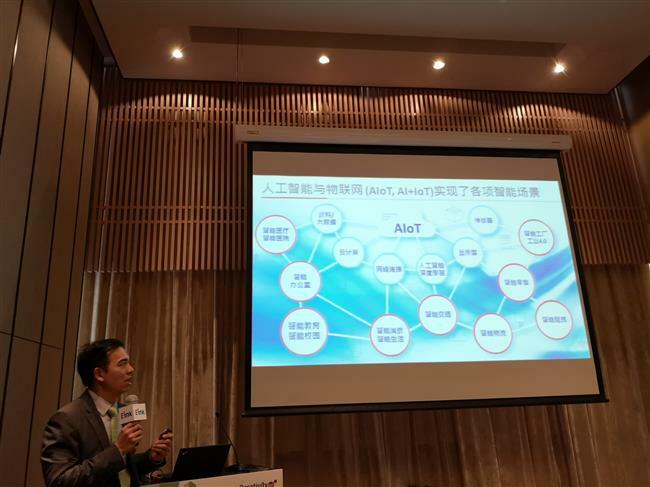 China is going to “dominate” industrial IoT markets as it will have 13.8 billion IoT connections by 2025, one-third of the global level, said researcher GSMA. In China, E Ink has more than 1,500 employees among 2,000 globally. It has set up a manufacturing plant in Yangzhou and sales offices in Shenzhen and Shanghai. It will open a global research center in Yangzhou around 2020, covering technologies like ACeP or advanced color ePaper, Ko said.